Kung Fu ( Gung Fu ) is based on a philosophy that pre dates even Buddhism .This philosophy recognises the inherent balance that exists everywhere in the cosmos and strives to make this balance real in one’s own life. 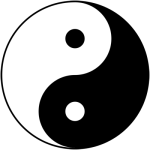 The symbols that best represents this philosophy is Yin Yang. The above is often associated with the study of Tao ( Tao – more correctly pronounced as Dao means “the way “ ) Kung Fu strives for the development of self awareness in each student so that each practitioner can strive themselves for balance and harmony. At its core Kung Fu concentrates on re establishing the intimate link between mind , body and spirit. Tao of Gung Fu “ Classes are for individuals who wish to investigate the mental discipline of martial arts as well as the Health and Well being aspects. It concentrates on the training of the mind , practising ways of looking at life , recognising existing patterns in nature and the search for balance. There is no combat and no conditioning . The path of exercise is the learning of forms and drills, through which the student develops a greater concentration, control , centering and core strength , precision and the manifestation of breath . Our traditional Gung Fu is the vehicle through which we find balance in our thoughts, perceptions and actions. We seek to walk with a fuller communion with our spiritual nature and through it be able to see our lives more clearly and direct our own lives more closely. The correct use of a bow is a journey of being aware and attentive to your energy flow through an object . As with all weapons within Chinese martial arts , the inanimate bow becomes dynamic as you interact with it . As such the use of a bow requires an ever developing fine awareness of self intent and it’s articulation into action . Growing proficiency with the bow requires one to move from the cognitive to the intuitive. It requires mindfulness and being in the moment. The way of traditional archery is a path to balance.